1. Bluestone Lake, Summers County, W. Va.
Bluestone Lake, Summers County, W. Va.
An aerial view of Bluestone Lake in Summers County. 2. Bluestone Lake, Summers County, W. Va.
3. 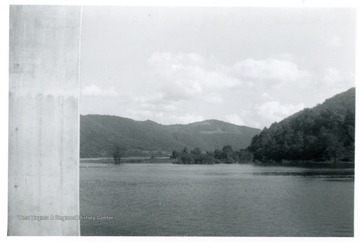 Bluestone Lake, Summers County, W. Va.
4. Bluestone Dam and Lake, Summers County, W. Va.
Bluestone Dam and Lake, Summers County, W. Va.
5. 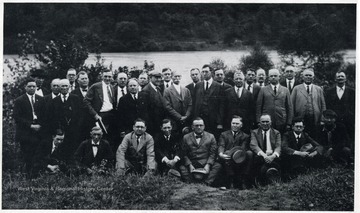 Men Who Worked to Get Bluestone Dam for Hinton, Summers County, W. Va.
Men Who Worked to Get Bluestone Dam for Hinton, Summers County, W. Va.
6. 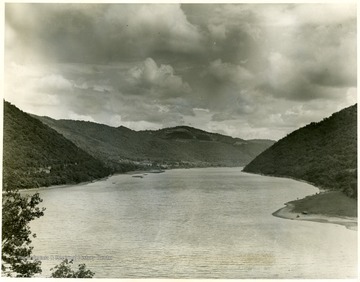 Bluestone Lake, Summers County, W. Va.
7. 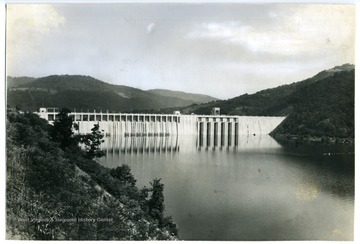 Bluestone Dam, Hinton, W. Va.
Bluestone Dam, Hinton, W. Va.
8. 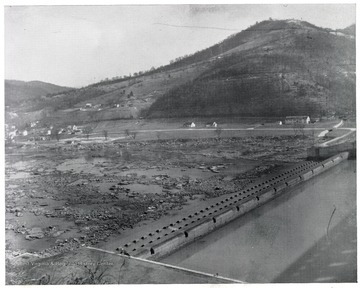 Quarantine at Bluestone Reservoir C.C.C. 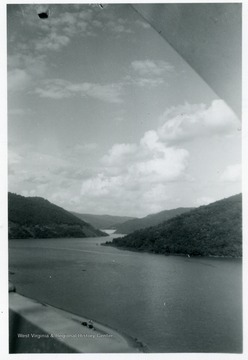 Camp, Summers County, W. Va.
Quarantine at Bluestone Reservoir C.C.C. 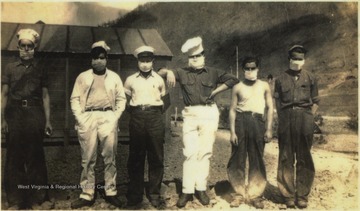 Camp, Summers County, W. Va.
Six unidentified men wearing quarantine masks due to a death from spinal meningitis. The quarantine lasted 30 days for all personnel at the Civilians Conservation Corps (CCC) camp. 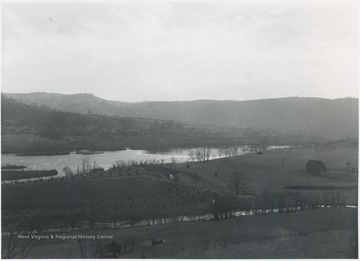 The CCC constructed projects including bridges, buildings, overnight cabins, retaining walls, roads, dams, towers, picnic areas, and drainage systems. 9. C.C.C. 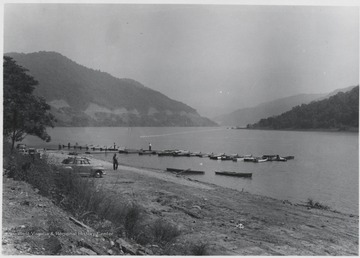 Workers on Ferry to Cross Bluestone Reservoir, Summers County, W. Va.
C.C.C. 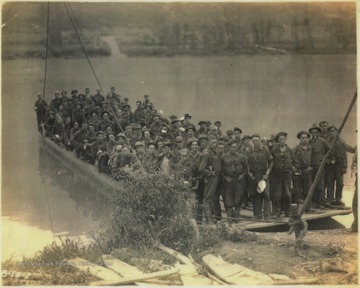 Workers on Ferry to Cross Bluestone Reservoir, Summers County, W. Va.
A group of unidentified workers from the Civilian Conservation Corps pose on the ferry which was built to cross New River to save workers the hassle of having to drive to Hinton and cross the river at the old toll bridge. 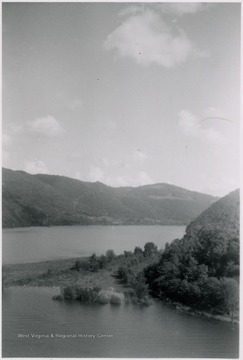 The ferry then took the men up the Bluestone River where "the clearing of right of way was started", according tot he photo caption. 10. Indian Creek near Mouth of New River, Summers County, W. Va.
Indian Creek near Mouth of New River, Summers County, W. Va.
View of the water before becoming Bluestone Lake. 11. Bluestone Boat Dock No. 1 at Bluestone Reservoir, Summers County, W. Va.
Bluestone Boat Dock No. 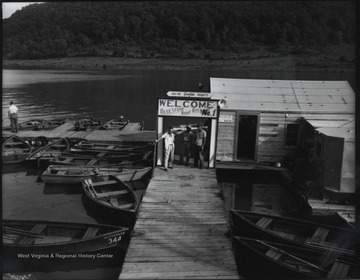 1 at Bluestone Reservoir, Summers County, W. Va.
Three unidentified men stand beneath a sign that reads, "Welcome--Bluestone Boat Dock No. 1". Empty row boats surround the dock. 12. Paddle Boat Dock at Bluestone Reservoir, Summers County, W. Va.
Paddle Boat Dock at Bluestone Reservoir, Summers County, W. Va. Unidentified persons scatter across the dock and lake shore.